In the course of the UNECE/FAO Metsä 2013 conference and the European Forest Week in Rovaniemi, Finland, both organizations held a joint side-event at the Hotel Santa Claus on 11 December. The aim was to raise awareness about the importance of forestry education at an academic level and identify related needs and challenges. The event was attended by about 100 participants, including many students, as well as representatives from international organizations, industry, and academic institutions. During 90 minutes, presentations were delivered by students and academics, followed by a lively debate with the attendees. The Metsä 2013 conference, short for the joint session of the UN Economic Commission for Europe’s Committee on Forests and the Forest Industry and the UN Food and Agriculture Organization’s European Forestry Commission, took place in Rovaniemi, Finland, from 9-13 December. Simultaneously, a second European Forest Week, organized by 15 official partner organizations from the European forest sector, including IUFRO and IFSA amongst others, was held across Europe. 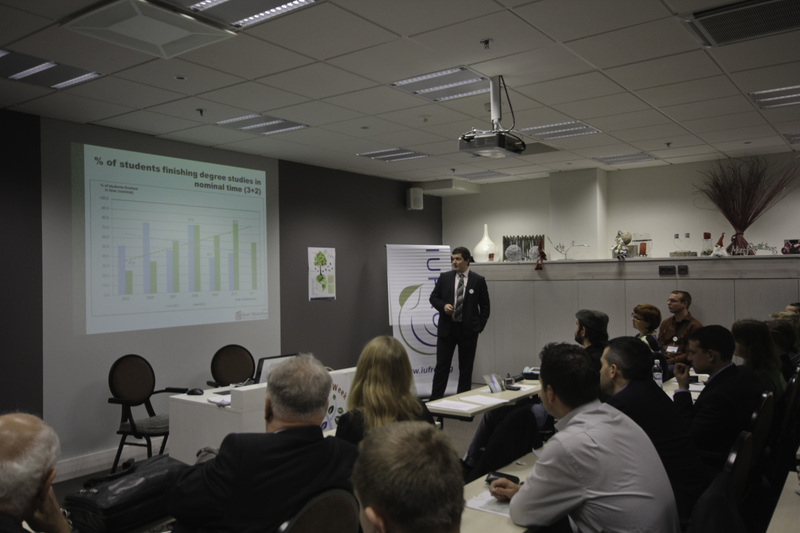 Entitled “Future of Education – Future of the sector?”, the event was introduced by Professor Piotr Paschalis-Jakubowicz, Coordinator of IUFRO Task Force Education in Forest Sciences. After briefly presenting the work of the Task Force, he pointed out the fast evolution in the forestry sector over the last decades and the subsequent change of needs in the professional working environment. Professor Paschalis stated that future forestry education should emphasize generic skills and methodical competencies rather than contents and descriptive approaches, and should also integrate and communicate knowledge across disciplinary boundaries in order to match the diverse demands of the sector. Following this presentation, students shared their perspective and experiences. Jakob Hörl, Head of IFSA’s Forestry Education Commission, gave a short description of IFSA, the global network of students of forest and related sciences. He elaborated on the potential and importance of IFSA to represent the students’ input in this debate and reinforced the willingness of IFSA to collaborate with IUFRO in this matter. After this, Kathrin Rees-Müller from Germany and Andre Purret from Estonia provided the attendees with an overview of post-secondary Forestry Education in their respective countries and invited the participants for a general discussion. The outcome of this discussion showed clearly that the sector has been facing fundamental changes, bringing along new demands and expectations of stakeholders and society. The future forestry experts need to acquire new skills and professional expertise that allow them to identify and meet present and future challenges and opportunities in a flexible manner. At the same time, core competences in forestry will be needed also in the future. Therefore, choices will have to be made in order to balance these demands without overburdening the curricula of future forestry graduates. Based on the positive response from the participants at this side event, IFSA and IUFRO both agreed to develop a joint action plan to systematically assess the status of education at the academic level and to provide options and guidance for the future.